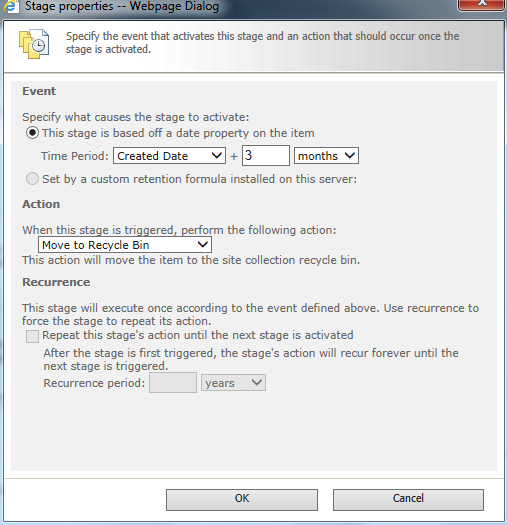 Recently during automation of one of the scenario, we required that items in SharePoint list are deleted after 90 days but the list should be archived as CSV to file share before removal. Click OK to get out of list settings. Now you have set the List for removing items that are 3 months old. Let me Now share the Power-shell code sample that will extract the list in CSV & than delete the items from it. You have to customize the code according to list columns. $log1 = ".\Logs" + "\" + "Splistarchive_" + $date + $time + "_.log"
$output1 = ".\Archivecsv" + "\" + "Sp_List_" + $date + "_" + $time + "_.csv"
$logs = ".\Logs" + "\" + "Powershellsplarchive" + $date + "_" + $time + "_.txt"
Add-Content $log1 "$date Delete List item with ID $ID"